‘Flight of the Navigator’ Remake Is Happening!!! I can’t believe I am writing this. But, Disney is remaking their amazing 80’s time travel/alien film ‘Flight of the Navigator’. The creative team behind the movie ‘Safety Not Guaranteed’ Colin Trevorrow and Derek Connolly will be developing the remake with Trevorrow to direct. The original 1986 film was directed by Randal Kleiser and starred a young Joey Cramer and co-starred Veronica Cartwright and Sarah Jessica Parker, with Paul Reubens as the voice of the robotic alien. All is being kept under wraps as of now for the remake, but I do knowthat Brad Copeland was hired to write the first draft of the remake a few years ago according to Variety. 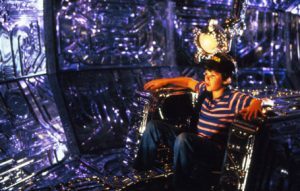 “‘Flight of the Navigator’ wasn’t a seminal movie of my childhood but I remember liking it and the original meant a lot to Colin as a kid, so it’s really his baby. It’ll be good to have some balance so it’s not two fanboys writing the movie,” Connolly said. Not sure how I quite feel about a remake of this, but who knows? What your thoughts? ‘Star Wars: Episode IX’ Is Getting A New Writer!!! This entry was posted on Thursday, November 29th, 2012 at 11:35 am	and is filed under Film, News. You can follow any responses to this entry through the RSS 2.0 feed. You can skip to the end and leave a response. Pinging is currently not allowed. « Check Out The ‘Django Unchained’ Soundtrack Listing, Plus The Final Trailer!!! This is double-paned sound-proof glass. There is no way that neighbor could've heard Roger Podacter scream on the way down with that door shut. The scream she heard came from inside the apartment before he was thrown over the balcony and the murderer closed the door before he left. Yes. Yes. Oh, yeah. Can ya feel that, buddy? Huh? Huh? Huh? I have exorcised the demons... this house is clear.